But now, you’ve got two new options for polling: PickFu Solo and PickFu Ranked! The PickFu Solo poll is a useful solution when you want to ask an open-ended question or you only have one creative concept you want to test (that is, you haven’t created variations that you’re looking to narrow down). Perhaps you have a book cover that you’ve created and you want to see if it’s intriguing to fiction readers. Or maybe you just finished a video, and want to ask how females react to its message. Or, like this pollster, you are looking for people to contribute ideas – see a sample Solo poll. In a PickFu Ranked poll, we’ll present your 3 to 8 ideas all at once to respondents. Each respondent will rank their favorites as #1, #2, and #3, then write a comment explaining their ranking. We’ll aggregate their votes to name an overall winner and rank the rest of the ideas. Here’s a sample Ranked poll where the pollster wanted to see which colors were preferable. Head-to-Head and Ranked: What’s the difference? Both the Head-to-Head and Ranked polls can test up to 8 ideas. However, the manner in which each poll is conducted is different. In a PickFu Ranked poll, your ideas are all presented at one time, in a single poll. Respondents rank their choices and write an explanation as to why they ranked them this way. This yields less written customer feedback than in a Head-to-Head scenario because it is only one poll. But because it is only one poll, the Ranked poll usually takes less time to complete and costs less to conduct (Though generally true, it depends on targeting criteria, number of respondents, and number of options tested). 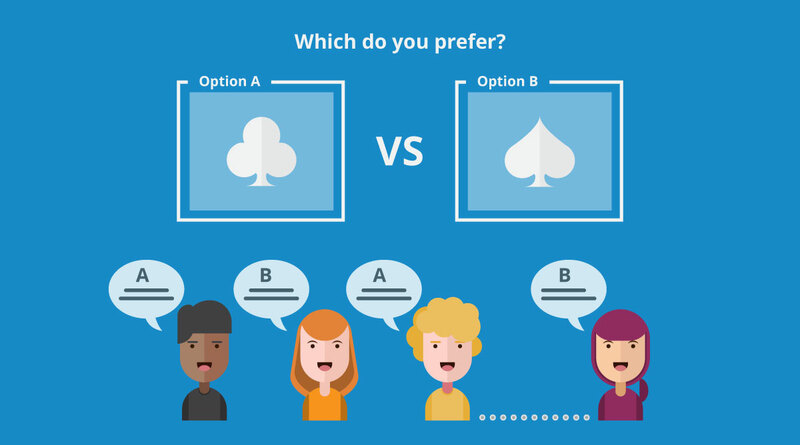 In a Head-to-Head poll, your ideas are presented in a round-robin fashion, meaning each idea is tested head-to-head against every other idea in the set. This yields the most written feedback because respondents participate in multiple polls. Your concepts will be ranked according to aggregate poll results. Head over to PickFu.com to create a new Solo, Head-to-Head, or Ranked poll now! Or, compare our products to see which one best fits your needs.